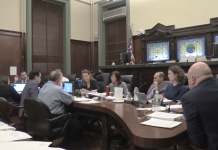 After more than four hours of hearing from members of the public, the Jersey City Council voted unanimously to approve a one percent payroll tax for local businesses in order to fund the public schools. Ward F Councilman Jermaine Robinson, who owns and runs the Light Rail Cafe, abstained from voting on the payroll tax when it was introduced as a first reading at the council’s previous meeting on November 7. 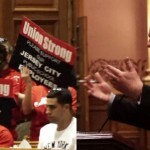 However, he voted yes yesterday because he ultimately he wants to see Jersey City Public Schools fully funded and withstand an expected $175 million in funding cuts from the state over the next several years. 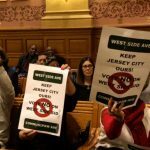 “I felt it was just my duty to make sure that instead of abstaining, I wanted to really make a point that if it’s going to hurt me, which I do believe [the payroll tax] is going to hurt a lot of small business owners around the city, I’m going to just tighten my belt and go all in and make sure that the kids are well educated,” Robinson said. Meanwhile, Council President Rolando Lavarro spoke for more than 10 minutes before casting his vote. 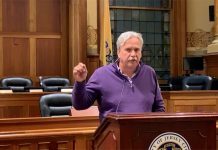 He wanted to first explain why he introduced his own version of a payroll tax at a council caucus meeting on Monday evening, explaining that he wanted to reach a compromise with the business community by adding a sunset provision where the tax would expire after two years. 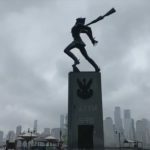 We asked him if he voted reluctantly, since the council voted on the version introduced by Mayor Steven Fulop. “It was not a reluctant vote. Would I have preferred my alternative and solution that I proposed at the council caucus? I would have. 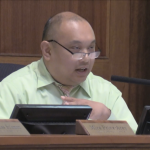 But knowing that this was the only option before me and that I had to cast a vote, and that there wasn’t anything else coming up for a vote…I know that we need to fund our schools and so this will move forward,” Lavarro said. We followed up by asking if he expects the businesses to fight tooth and nail against the new legislation. “I do expect them to issue a court challenge at the very minimum, and then there’s a petition and referendum process that they make undertake,” he began. 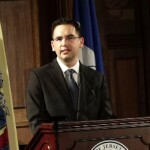 On that point, Andrew Musick, of the New Jersey Business and Industry Association, which represents 150 businesses in Jersey City, said that although the association understands the importance of a quality education for all students, they fear the negative impact the tax will have on both large and small businesses. “This proposal will add to the cumulative impact on business when combining it with the corporate business tax surcharge and increased income tax rate, as well as new and forthcoming labor and energy mandates,” Musick stated. 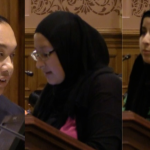 While someone occasionally spoke out against the measure, they were vastly outnumbered by dozens who were in favor. Those that pushed for the payroll tax included state Senator Sandra Cunningham (D-31), who introduced the initiative in the legislature, Board of Education President Sudhan Thomas, Assemblywoman Angela McKnight (D-31), Freeholder Jerry Walker (D-3) and former Councilman Chris Gadsden – the latter who is now the Lincoln High School principal.